An agreement has been reached for the rollout of new traffic management systems that aim to improve journey times for users of the busy Dartford Crossing in Kent. Motorists and fleet operators planning journeys in the area will be pleased to learn that a range of measures are now being implemented that will make traversing the crossing that much more straightforward and faster in the months to come. New signposts have been erected on local roads to inform motorists of traffic conditions ahead, while new lane markings have been added to junction 1A and junction 1B of the Darenth Interchange to improve traffic flows. Meanwhile, new journey time monitoring technology has been installed on three key routes approaching the crossing to help better manage traffic volumes and driver delays in the future. The move follows the introduction of the new Dart Charge system, which has now been in operation for more than a year at the Dartford Crossing and has to date proved invaluable in reducing journey times. 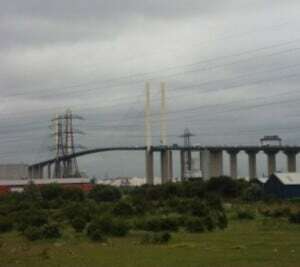 However, plans are now also being discussed for a new Lower Thames Crossing, which would take significant pressure off the Dartford Crossing in the future. Tommy Whittingham, M25 route sponsor for Highways England, said: "We've always been clear that removing the payment barriers is just a medium-term solution for congestion at the Dartford Crossing and that, in the longer term, a new Lower Thames Crossing is needed. But we still need to do everything we can to keep this vital transport gateway flowing. "We are developing this package of improvements, which we believe will have a positive impact on journey times, and we are committed to delivering them as quickly as possible."